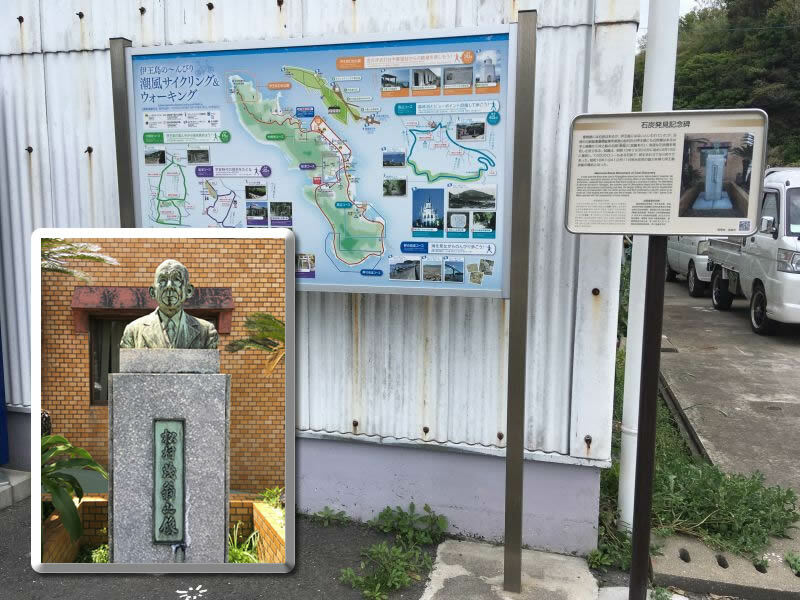 It was said that there was coal in Koyagi Island but not in Iojima, however, Mr. Matsumura, executive director at the Kaho mining office of the Nittetsu Mining Co., ltd. at the time, believed from experience that there must be a coal bed in Iojima. He attempted to drill into the land in “Norigoe”, the northern part of Okinoshima Island and this is the place where discovered a promising coal bed. He began drilling into the land in September, 1935 and on December 13th, he came across coal that contained a calorific value of as much as 7,000 kcal/kg and that was over 9m in length. On February 11th, 1941, Iojima Coal Mine opened with the cooperation of local citizens. 고야기시마에는 있으나, 이오지마에는 없다고 전해졌던 석탄이었으나, 당시 닛테쓰 광업 가호(嘉穂) 광업소 상무였던 마쓰무라씨가 본인의 경험을 토대로 이오지마에도 석탄층이 있을 것이라며 오키노시마(沖之島) 북부에 있는 ‘노리고에(乗越)’에 시추하여, 이곳에서 유망한 석탄층을 발견했다. 1935년 9월에 시작된 시추는 12월 13일에 착탄, 길이 9m 이상, 7,000kcal/kg나 되는 석탄이 발견되었다. 이후 1941년 2월 11일에 지역 주민들의 협력으로 이오지마 탄광이 개갱되었다.